Remove MagVigen™ DNA Select nanoparticles from 4°C storage. 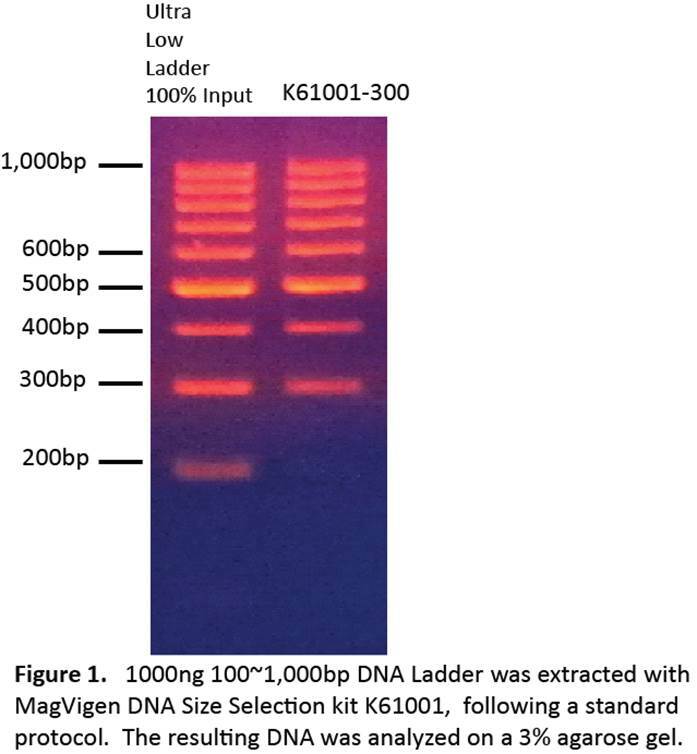 Add 40μl DNA sample to MagVigen™ DNA Select nanoparticles. Note: For every 40μl DNA sample, mix with 40μl MagVigen™ DNA Select nanoparticles. A volume ratio of 1:1 for DNA : MagVigen must be followed in order to separate DNA>=300bp. Keeping the magnet in place, wash the DNA-captured nanoparticle pellet by adding 100μl freshly prepared 80% ethanol. Let stand for 2 minutes. Q1: Why I still see a lot of small MW DNA in my sample? A1: K61001-300 is designed to remove <300bp DNA from samples. However, when DNA<300bp is over 400ng per 40μl sample, please dilute the DNA sample to total DNA~1,000ng and <300bp~400ng per 40ul. This is particular important when trying to remove adaptors that is overdosed in the ligation process. Q2: The cutoff is not clean in my sample. A2: First make sure the total DNA smaller than 300bp is <400ng per 40μl sample. Overloading MagVigen nanoparticles with DNA will result in carryover of small DNA. If problem persists, you may slightly decrease MagVigen volume to 36μl per 40μl DNA sample, this helps reducing carryover of small DNA. Q3: The yield is low. A3: Increase DNA-MagVigen mixture incubation time to 1 hour will significantly improve the yield.